ikomee is an e commerce website builder which has unique click an build features that allow the user to have full control over the design and maintenance of e commerce websites. iKomee was designed to give the user easy to use tools and features to design a fully functioning e commerce website , upload products and start trading the same day . No programing or design skills are required to obtain a fully functional e commerce website . The iKomee application can be used across all business types, from retail outlets to consulting agencies to a plumbing business. Regardless of the type of site you are creating, the build process is identical . iKomee offers a free website builder a free banner maker , free access to the e commerce builder.You only pay for premium service . 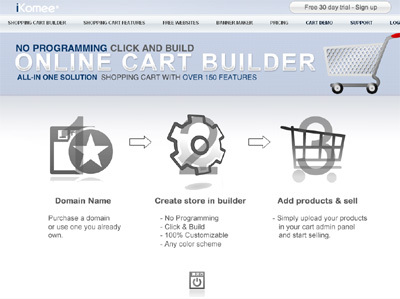 iKomee is the only fully customizable e commerce website builder . Its unique Click and Build features allow the user to build and run a professional fully functional e commerce website . iKomee offers a free website builder as well as a free banner maker . Users pay for premium service only . iKomee guarantees amazing results at minimum cost . iKomee makes e commerce trading easy , profitable and accessible to everyone .